For most parents, the birth of their child is a joyous event. However, when mistakes occur during the birthing or labor process, serious injuries to the baby may occur. Treating these injuries can be expensive. 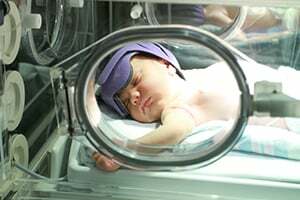 One possible birth injury is hypoxic ischemic encephalopathy, which occurs if a baby's brain is deprived of an adequate oxygen supply, even if the deprivation is not total. The condition can lead to cerebral palsy, other disabilities, or death. If your baby suffered hypoxic ischemic encephalopathy during the childbirth process, the experienced Chicago birth injury lawyers at Moll Law Group are available to help you pursue a claim or sue the responsible parties for compensation. Hypoxic ischemic encephalopathy (HIE) affects about 20 out of every 1,000 full-term births, and it occurs more frequently in premature babies. Some causes of HIE include gestational diabetes with vascular disease, cardiovascular disease, severe fetal anemia, preeclampsia, prolonged late stage labor, severe prematurity, congenital brain malformation, brain trauma, lung malformation, or infections. HIE is extremely dangerous and requires immediate medical care. In some cases, it is possible to reverse the effects of oxygen deprivation. Some treatments include mechanical ventilation, cooling therapy, medications, and hyperbaric oxygen treatment. In other cases, the injuries are permanent and can require lifelong care. Cerebral palsy is one outcome, and it is considered one of the most serious and prevalent disabilities. For many parents, the only way to pay for the needed care is by filing a birth injury lawsuit against the parties that caused the condition. Usually, these are the obstetrician, nurses, or hospital involved. Birth injury lawsuits may be brought when HIE is the result of medical negligence. For example, medical staff or doctors may fail to monitor the birth process by using fetal monitoring strips or fail to order a C section quickly enough to avoid brain damage. These lawsuits are often complex and require medical expert testimony from the very beginning. Generally, expert testimony will establish the standard of care and causation. However, expert testimony is not required if the conduct is grossly negligent, such that a layperson could understand that malpractice has occurred. Under section 2-622, when an attorney files a complaint in a medical malpractice lawsuit, including one involving birth injuries, he or she needs to consult with a doctor and present an affidavit stating that he or she has consulted with a doctor who believes there is a reasonable and meritorious basis for filing the lawsuit. A medical report from a health care professional knowledgeable in relevant issues in the lawsuit must also be attached. It must specify that the professional practices medicine or teaches in the same area of medicine and is qualified by experience or demonstrated competence to testify about the birthing process and HIE. An affidavit must be presented in connection with every defendant named in the lawsuit. If a baby dies due to HIE that arises out of negligent care by a doctor or other health care professional, an action under the Wrongful Death Act (740 ILCS 180/0.01, et seq.) may be brought. If your doctor's negligence during labor results in hypoxic ischemic encephalopathy, the Chicago attorneys at Moll Law Group are available to help you pursue compensation for the harm done. We represent victims and their families in Naperville, Wheaton, Schaumburg, and communities throughout Cook County. Billions of dollars have been recovered in the cases in which our firm has been involved. Contact us online or call us at 312-462-1700 to set up a free consultation with a medical malpractice attorney.